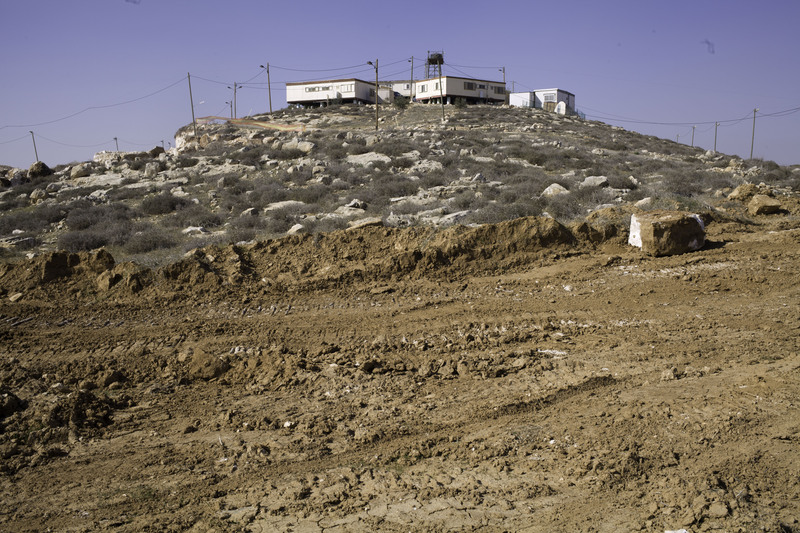 Asael, possibly the ugliest of all the illegal outposts in the southern West Bank—and the competition is fierce—is rapidly expanding. 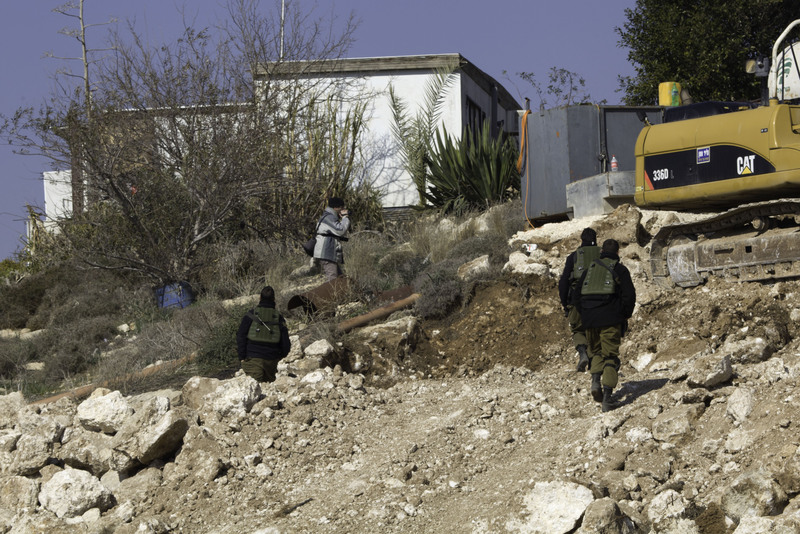 Yellow bulldozers, parked at the perimeter fence of the settlement, have carved out a huge swathe of intermeshed, criss-crossing gashes in the hill and valley just below. 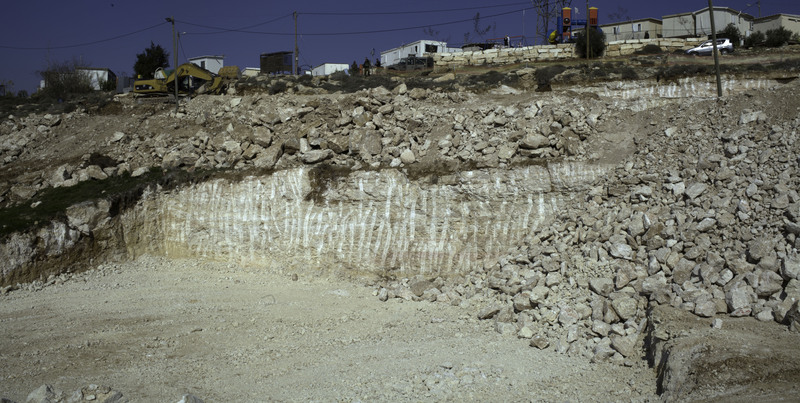 This wide, deep wound in the soil has been sliced, needless to say, through privately owned Palestinian land. We know the families. We’ve plowed here, on the edge of the outpost. There have been many bad moments with the Asael settlers, the ones we can see this Shabbat morning walking their dogs over the hill or praying to their rapacious god or swinging their children on the swings in the painted park just under their pre-fab caravans. Winter morning, sunny, ice-cold. Guy is photographing the earthen gashes meter by meter. The families who own the land will submit a complaint to the police, not that it will do much good. 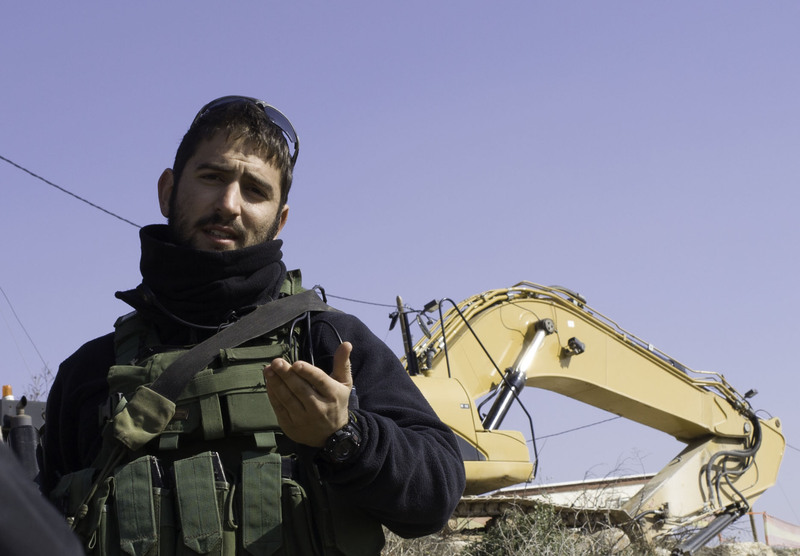 The Civil Administration stopped the bulldozers earlier this week, but the fact that they’re still parked here bodes ill. Each one of them costs a few thousands of shekels per day, and they’re still here. Actually, everything bodes ill here at Asael on this sun-drenched day. I can see what’s coming. Harmless chatter, nothing worse. I turn off the camera. Peg is still photographing, despite the officer’s repeated demands that she stop. It seems this business of the cameras is all we have to talk about today. Over and over again he tells us that we’re not being nice. Later, thinking back on it, I find the conversation insane, and I’m sorry I got into it. A monumental crime is taking place, here and everywhere in the occupied territories. It’s picking up speed. The soldiers are complicit in it, though it’s coming from far above them, from the prime minister’s office on down. And on this bright winter morning, the officer on the spot thinks we’re being impolite. 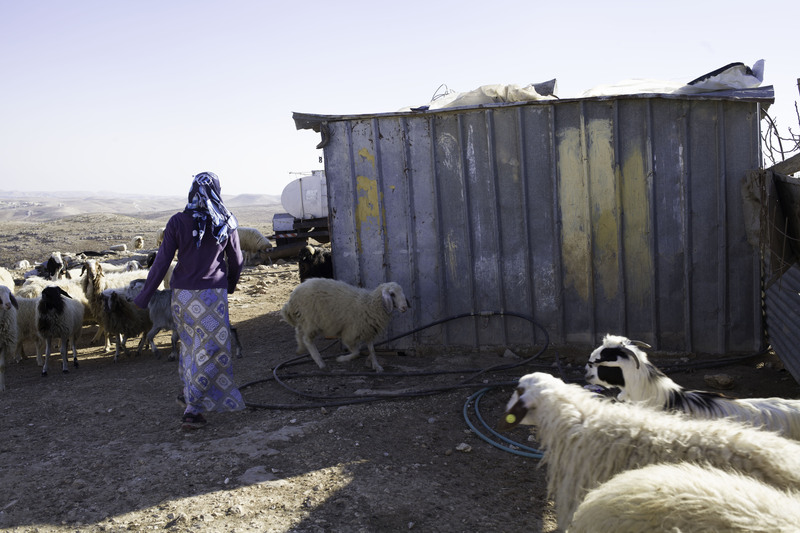 Last week something unusual happened at Susya. A group of fanatical settlers had produced an inscription made of stones on what we call Flag Hill—Palestinian land, of course (newly plowed). The stones were stacked up to read, in Hebrew: “Revenge.” There was also a big stone-piled star of David. Our people came upon these rocks, and the settlers came at them, and the soldiers turned up, and the settlers attacked them, too. This was too much even for the soldiers, who wrestled them to the ground and arrested three of them. They let them go in the evening, but for a brief moment the tables were turned. 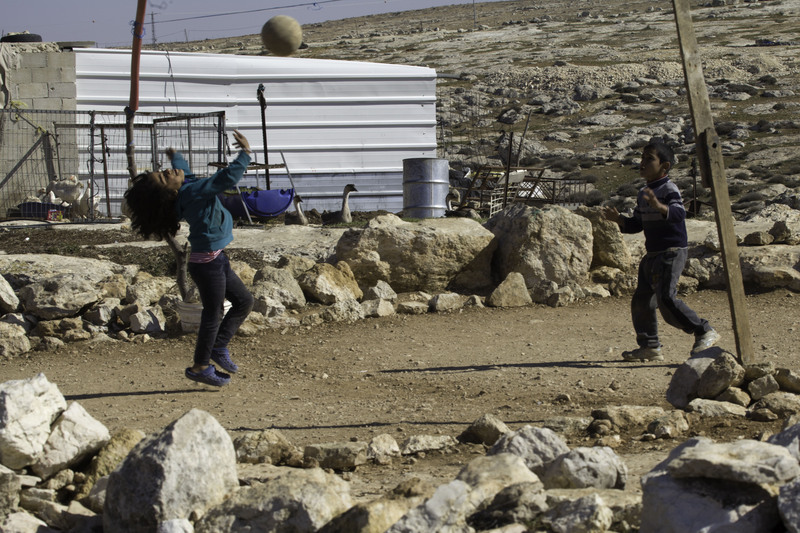 These are violent days in South Hebron, also in the Jordan Valley. We reach Twaneh around 2:00 and find a Ta’ayush detachment still shaken after being attacked by masked settlers from Chavat Maon. 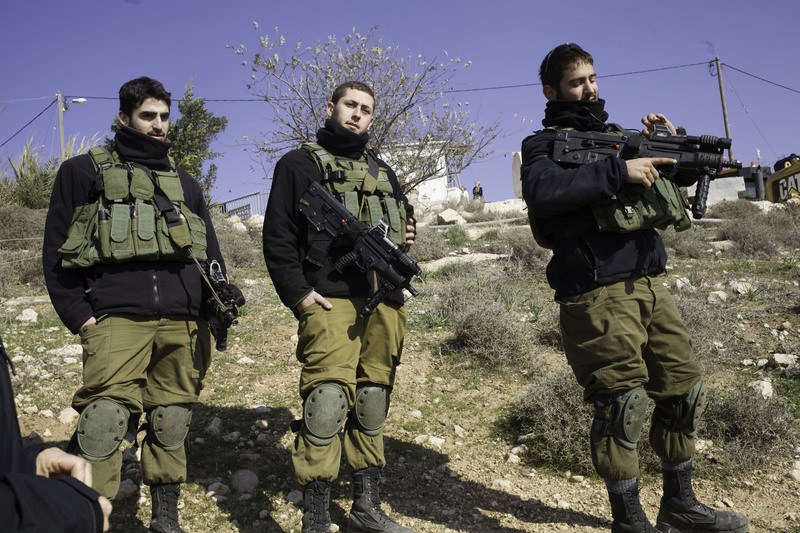 The Ta’ayush volunteers were there to protect Palestinian farmers who had come to plow. The plowing was successfully completed, and the volunteers were on their way back to Twaneh when fifteen settler thugs attacked, hurling big rocks, lots of them, and assaulting our people with their fists. Dudy was hit in the head by a rock. Danny was beaten. One of the Italian volunteers living in Twaneh was hit, and her (expensive) camera stolen. By sheer good fortune, no one was badly wounded or worse. Guy calls the police, who eventually respond. We head uphill toward the site of the attack. The settlers are still flitting through the trees at the end of the path. We have good video footage, but it rapidly becomes apparent that there’s little point in submitting a complaint. 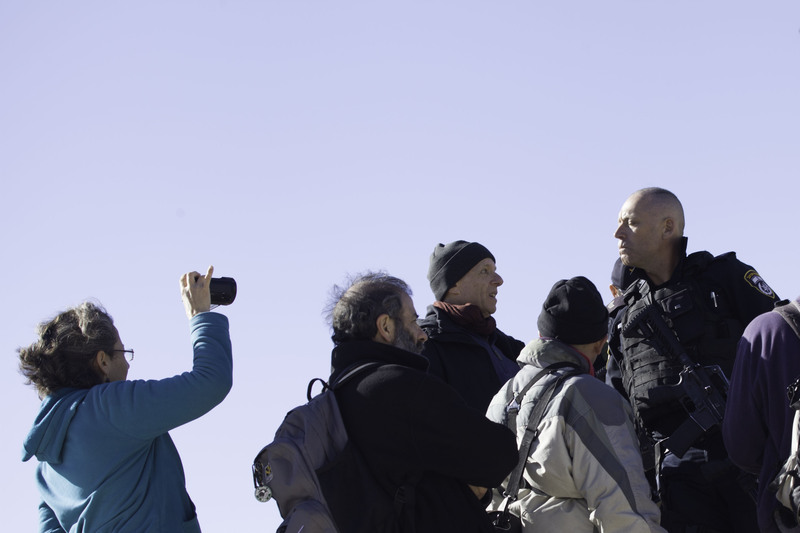 The police will do nothing, the settlers were masked, to fill out the police forms is hardly more than a ritual gesture. We move on. Fifteen years ago, almost to the day, I was attacked, beaten, stoned, and shot at by the settlers of Chavat Maon at this same point. I know what it feels like. I know for sure that they are celebrating their splendid raid and reveling in their spoils. Maybe I shouldn’t care. Post-Resettlement, exhibition by Ai Weiwei and Eid Hthaleen. Installation photographs courtesy of Ades Architectural Forum, Berlin. 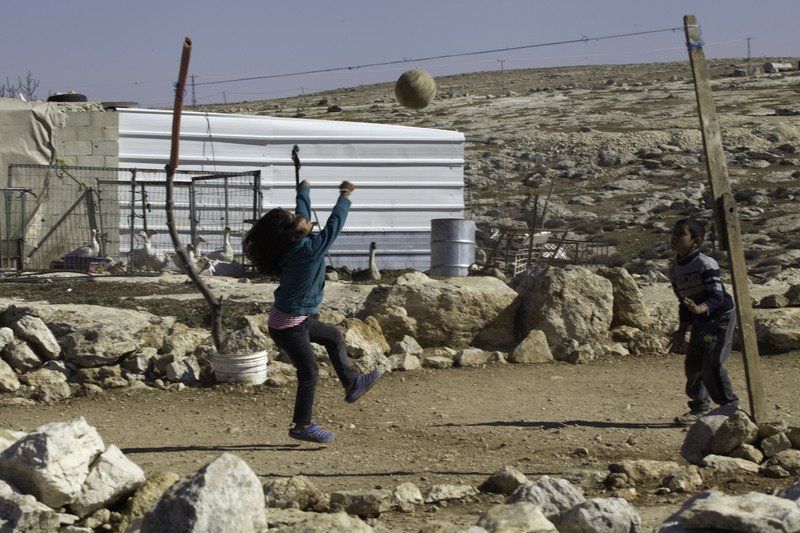 The settlement of Carmel abuts the shanties of Umm al-Khair, and recently the settlers have invented a new form of torment for their neighbors. 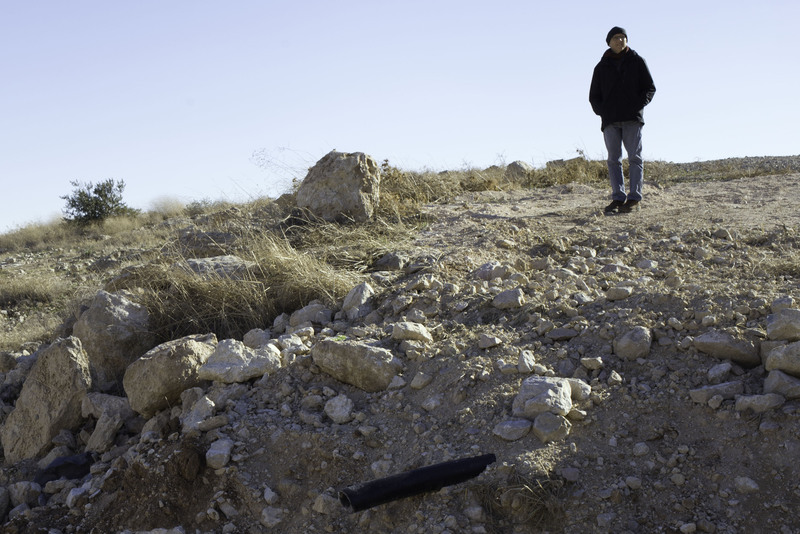 Their sewage now flows through pipes that open onto the fertile fields in the wadi and the Palestinian grazing grounds. We pick our way over the rocks to study the large open pipe. It’s one of those crystal winter afternoons. Every thorn stands out on the hills. Sheep cluster around the well on the next ridge. Ruins from the last four demolition raids are neatly stacked beside what used to be tents and homes. We’ve rebuilt a little, for the umpteenth time. The hills across the Jordan River turn to limpid mauve. It’s cold; one of the young girls, maybe four years old, in ponytail and a blue sweater, stands barefoot at the entrance to her home. Goats bleat; toward sunset, they get hungry. Tea appears. 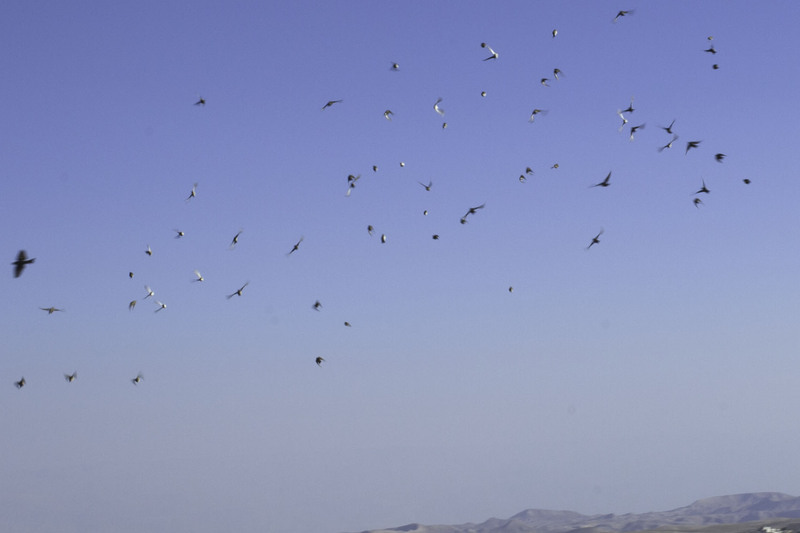 A wild parabola of pigeons swirls over the golden slope. Beauty is made from pain, great beauty from greater pain. Text © 2017 David Shulman; photographs @ 2017 Margaret Olin except as otherwise noted. I am amazed by your experiences and images of the last few months. Please stay safe as well as involved. Thanks, Jill and don’t worry!